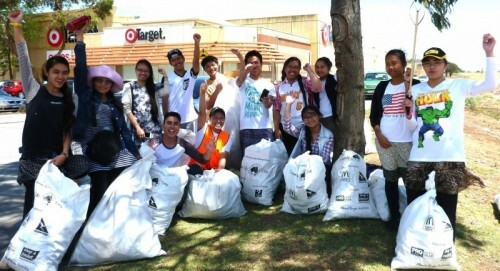 Members of the Church of God International Youth get a headstart on Clean Up Australia Day. Members of the Church of God International Youth have jumped in early with their Clean Up Day picking up 11 bags of rubbish in January - mainly fast food litter next to the Brimbank Central Shopping Centre. The group believes that if you just do "One Good Thing" a day, you can make the world a better place. 2015 is the 25th anniversary of Clean Up Australia Day and marks 25 years volunteer action across Australia. Last year, thanks to an estimated 572,406 volunteers 15,708 tonnes of rubbish were removed from 7,140 sites across Australia. Clean Up Australia Day is on Sunday 1 March. Clean Up Australia Day 2015 - Get Involved! Get involved by joining a local site or register one of your own. Clean Up Australia has made it easy to run your own event, and Council can assist with any questions you may have. To find your closest Clean Up site, or register a site of your own, visit the Clean Up Australia Day website or phone Council’s Environment Department on 9249 4717.